Lintu's awareness of internal balance is masterly (...). Lintu makes Messiaen's competing layers dance sensually around each other. 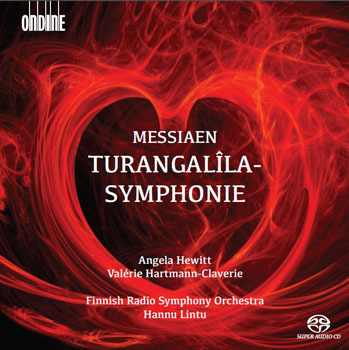 This new Ondine recording contains Olivier Messiaen's (1908-1992) magnum opus from the 1940s, the large-scale Turangalîla-Symphonie conducted by Hannu Lintu. The recording features as soloists the renowned pianist Angela Hewitt as well as Valérie Hartmann-Claverie, who plays the rare electro-acoustic ondes Martenot instrument which, alongside with the piano, has a substantial role in Messiaen's work. This release continues Hannu Lintu's brilliant Ligeti recording with the Finnish Radio Symphony Orchestra (ODE 1213-2; Gramophone Editor's Choice) and points out once again Lintu's skills with works by 20th century composers. The Turangalîla symphony is a gigantic work with two soloists and is cast in ten movements. Above all, Turangalîla is a symphony of love, but also much more. The composer himself described his symphony with the following words: "Turangalîla means all at the same time song of love, hymn to joy, time, movement, rhythm, life and death". After the Introduction of the first movement which lays out the basis of all subsequent material, movements two, four, six and eight evolve as explorations of the theme of love; movements three, seven and nine develop the darker associations perhaps of death; and the fifth and tenth movements act as overall summation points for the two halves of the symphony. Within the microcosm of this vast symphony, Messiaen provides continuity and cohesion with recurrent musical images and reference points, redolent of the leit motifs, idées fixes or cyclic themes of the great Romantic composers. Serge Koussevitzky, who originally commissioned the work from Messiaen, was convinced that the Turangalîla-Symphonie was the first great milestone to appear on the musical horizon since Stravinsky's Le Sacre du printemps.